Our Patented EE-PAC is a high efficiency screw blower system providing the efficiency of a turbo blower over a 5:1 turndown, but without risk of surge or complex controls. It is a 100% oil-free screw compressor directly coupled with a DC motor and on-board variable speed drive. This blower system is designed for optimal efficiency, higher performance ranges, easier maintenance, and longer life capabilities over other competing systems. 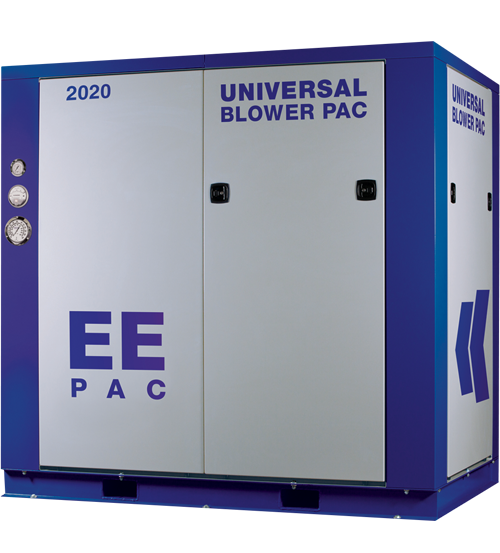 EE-PAC is up to 35% more efficient than traditional positive displacement blower systems (PD blowers). With a full enclosure, on-board controls, and optional instrumentation package, the EE-PAC has everything you need to maximize energy savings. 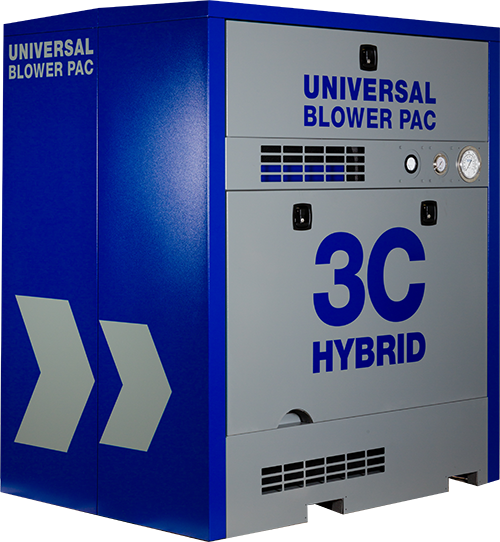 Our HYBRID is the latest technology in screw blower combined with our stylish, compact 3C-PAC platform. With options for a tri-lobe screw or a four fluted screw with pre-internal compression, we have the most developed offering of screw technology on the market. Direct Coupled Drives are an easy way to save 5% energy by eliminating belt transmission losses. If you are already utilizing a VFD, a Direct Drive system can easily be designed for immediate energy savings. Other systems can be reviewed for options without the use of a VFD as well. With the additional benefits Direct Drive offers, it is a great way to save on money and energy. UBP has always strived for energy efficient products. We have utilized screw technology and direct drive systems for decades. In order to fit an energy efficient system into your budget, we can start with one of our standard products and add flexible design options. This allows the system to fit within your budget and increases your return on investment with an energy efficient solution.